It’s no secret that the internets love for cats are at insanely high levels, but this latest story might have just tipped cat lovers everywhere over the edge. 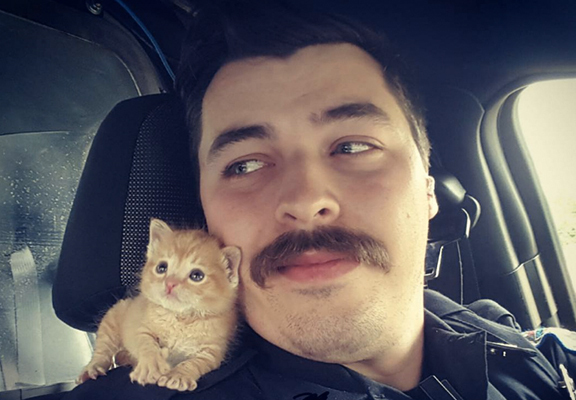 Police officer Cody Garrett, from Spartanburg, South Carolina was working the late shift with another officer when he heard a small animal crying underneath a dumpster nearby, BuzzFeed reports. Turns out it was a tiny kitten, queue the awww’s. They decided take it back to the station, but were a bit unsure what to do with her. However, no stranger to cats, Garrett, 28 – who has four of his own – decided to name it Squirt and take her home. Garrett probably realised that this was pretty damn cute, but he didn’t quite realise how cute, as the internet is now completely in love with the pair. The post quickly went viral and has been racking up the likes, with Garrett even getting marriage proposals purely because of the snap. Oh internet. Although he’s not looking for romance, Garrett hopes that this story will help people think more positively about police in the future. Police officers aren’t the enemy. We have families, we like rescuing animals and playing video games. We’re not just out doing the crazy stuff people see on the news.